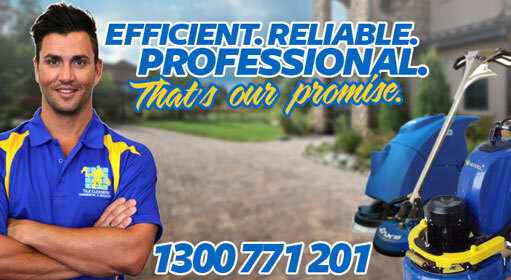 Tile Cleaners Sydney® prides itself on providing Australia's best marble stripping and sealing service. 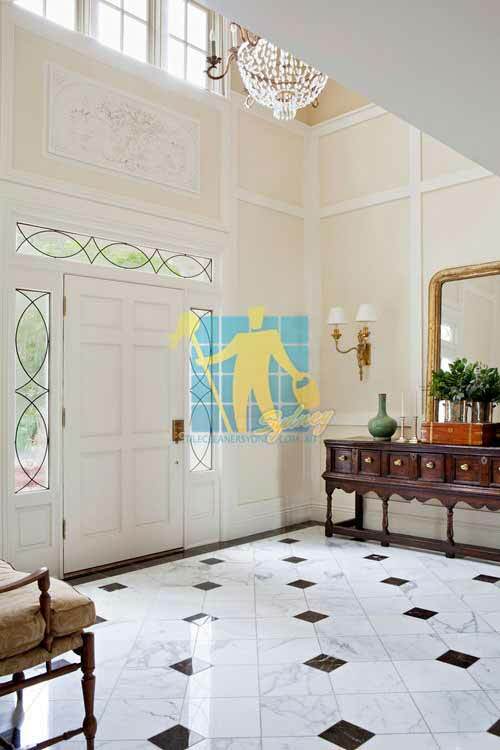 Our years of experience in the field of tile and stone protection results in your marble looking its absolute best, protected against staining and deterioration for the longest possible time. When your marble tiles begin to appear dull and start to stain easily, that means your previous sealer is wearing off and your tiles are in danger of permanent damage. Tile Cleaners Sydney® strip/remove all necessary worn sealer from your marble tiles, restoring their fresh look using our advanced, proven equipment; we then seal your marble tiles with one of our top quality water based products. When your marble tiles begin to appear dull and start to stain easily, that can mean your previous sealer is wearing off and your marble tiles are in danger of permanent damage. 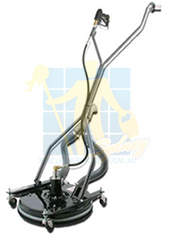 Tile Cleaners Sydney® strip/remove all necessary old sealer from your marble tiles, restoring their natural fresh look using our state of the art cleaning equipment. No matter where your marble tiles are, Tile Cleaners Sydney® will strip, clean and professionally reseal them for you. In your kitchen, shower, bathroom, around the swimming pool, your backyard, outdoors or any hard to reach indoor areas. 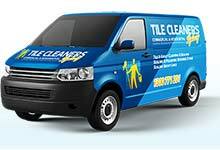 Tile Cleaners Sydney® are your specialist service provider for all marble tile & grout cleaning. If you need advice on how to clean your old or brand new marble surfaces and tile grout and how best to reseal your marble so it stays looking new, or need a professional to do it for you then you have come to the right place. 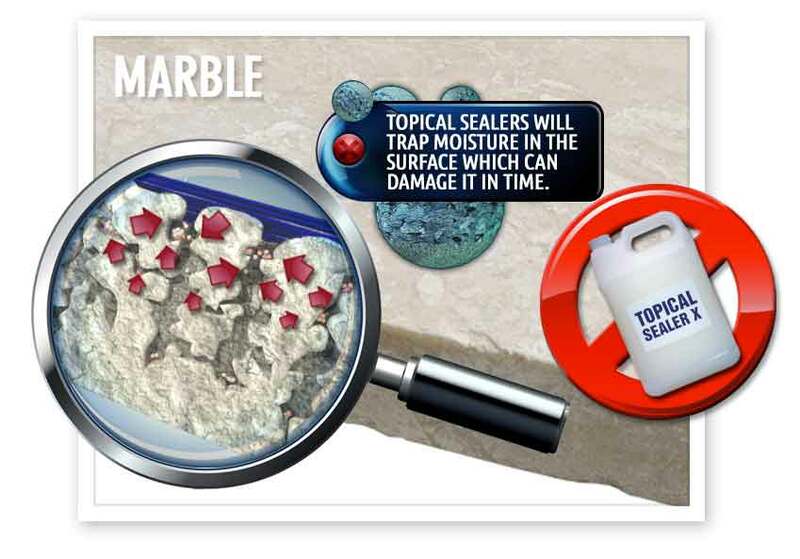 Tile Cleaners Sydney® recommend penetrating water based sealers for marble wherever possible. 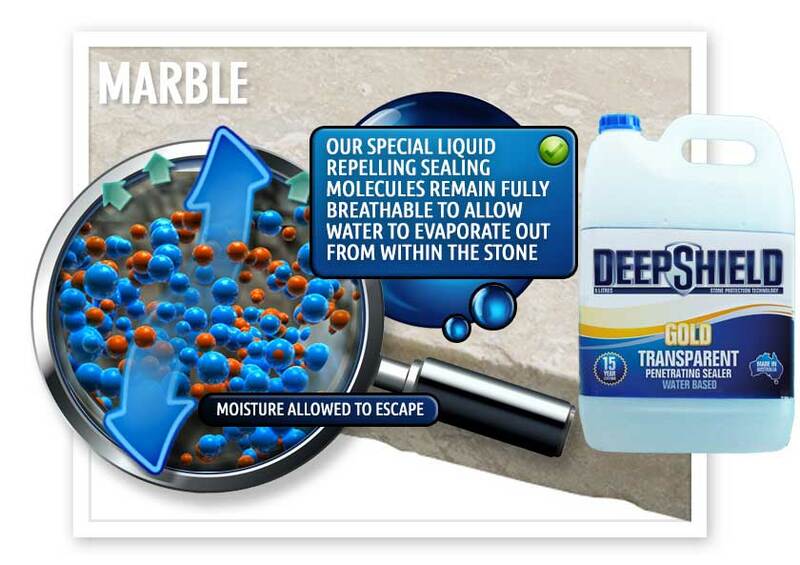 Transparent penetrating sealers are designed to maintain the natural look and feel of your marble. 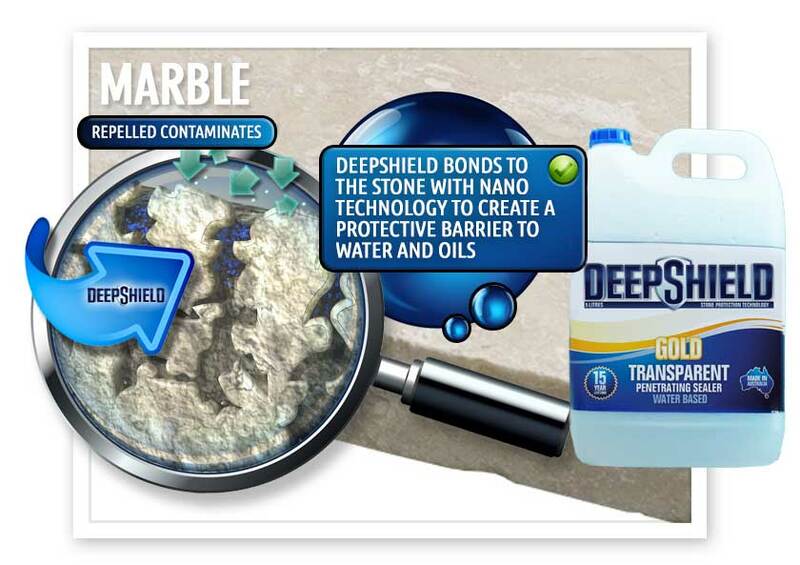 Australia's Deepshield® GOLD offers long term benefits, protecting your marble surface and grout from absorbing stains for up to 15 years by chemically reacting with the surface pores to form a long lasting breathable protective barrier. 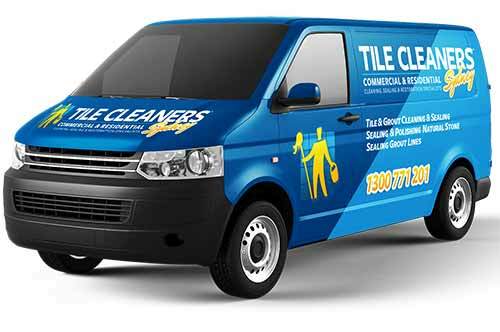 Tile Cleaners Sydney® are experts at applying all types of sealer and will ensure your marble looks its absolute best. Tile Cleaners Sydney® experienced technicians can apply a topical sealer when especially required to create a high gloss, satin sheen or matte finish to your surfaces. Topical sealer is also helpful in situations where the old solvent based sealer can not be completely removed or when required to hide certain types of damage. 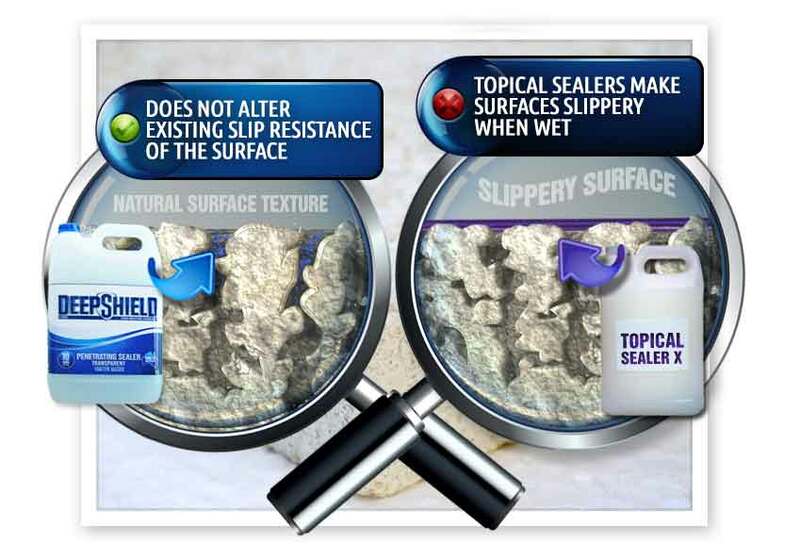 Topical sealer's have a life expectancy of 3-5 years. Solvent based products are more difficult to apply and can create major problems when applied incorrectly as they are very hard to remove. 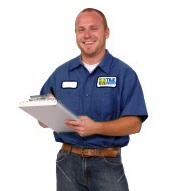 Tile Cleaners Sydney® recommend our clients apply a long lasting water based sealer to their marble tiles and grout. 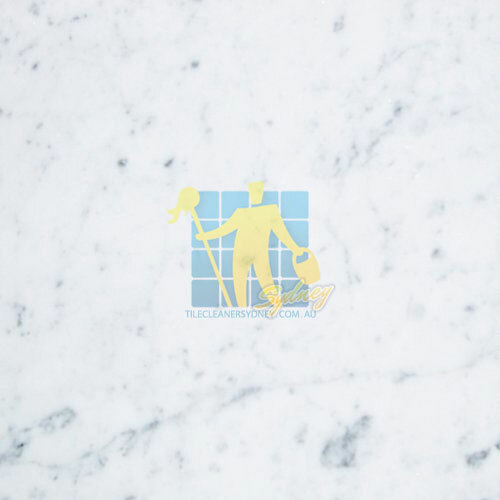 Topical sealer's (glossy plastic coating over the top of the marble) are still used on marble, but these older style sealers can trap moisture in the stone and make the surface slippery when wet. When a topical sealer wears in higher traffic areas, the entire surface usually needs to be stripped and re-sealed.